BRYAN WHITMAN (Pentagon spokesman): Good morning. 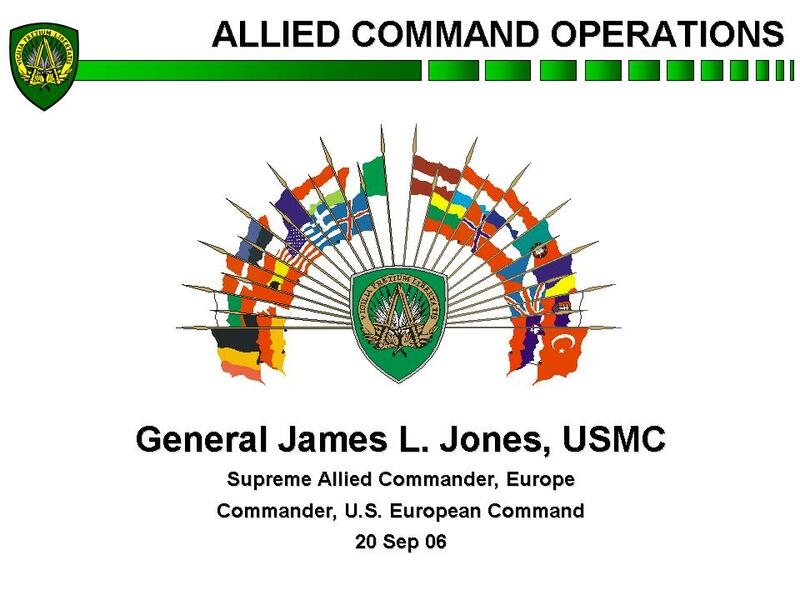 And once again it's my pleasure to introduce to you General James Jones, Commander EUCOM, and also Supreme Allied Commander Europe. He is here along with the rest of the combatant commanders this week and, as always, has offered to give us some of his time to give you an update on Afghanistan. And so we appreciate it, General. And let me turn it right over to you. GEN. JONES: Well, thanks very much. And good to see you all again. I didn't think it was going to be this quick -- (laughter) -- but I'm happy for the occasion, genuinely so. What I'd like to do this morning, with your permission, is just make a couple of opening statements to pick up on where we were when we last talked. I want to update you on Operation Medusa, which occurred in the southern part of the country recently. I'd like to add some more information and some context to our efforts with regard to the overall force generation for the NATO forces in Afghanistan, and then a few words on the long-term way ahead for our efforts in that country. I have a few charts that will magically appear as I talk. This first chart, again, by way of just starting wide and necking down, shows that NATO is engaged in operations on three different continents with 38,000 troops deployed in support of operations ranging from training missions to, as we've seen recently in Afghanistan, some offensive operations. Our main effort remains focused on Afghanistan; that is the alliance's point of main effort right now. The International Stabilization and Assistance Force mission is proving to be the most demanding operation that NATO perhaps ever has been involved in. 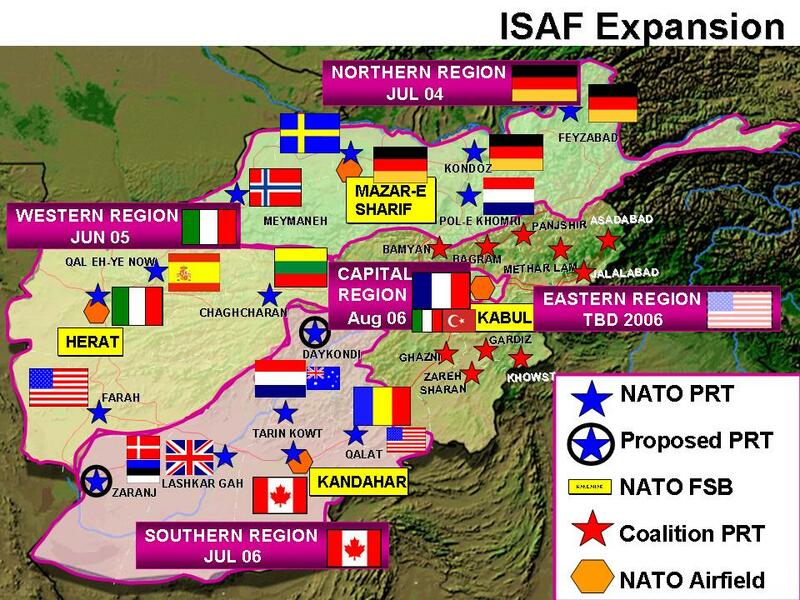 This next slide shows the expansion of ISAF throughout Afghanistan, starting with the north. And today NATO finds itself responsible for over three-quarters of the country with 37 NATO and non-NATO nations, with over 20,000 troops committed to the effort. The Provincial Reconstruction Teams, the total of which are about 23 throughout the country, are used by NATO increasingly to help establish our presence. We operate primarily in a permissive environment, concentrating on stabilization through the provision of a secure environment, allowing the international community to reconstruct areas that might otherwise be inaccessible to them. PRTs are an essential part of our strategy. They are the most visible expression of good things happening in areas where the government has not been able to establish its presence yet. 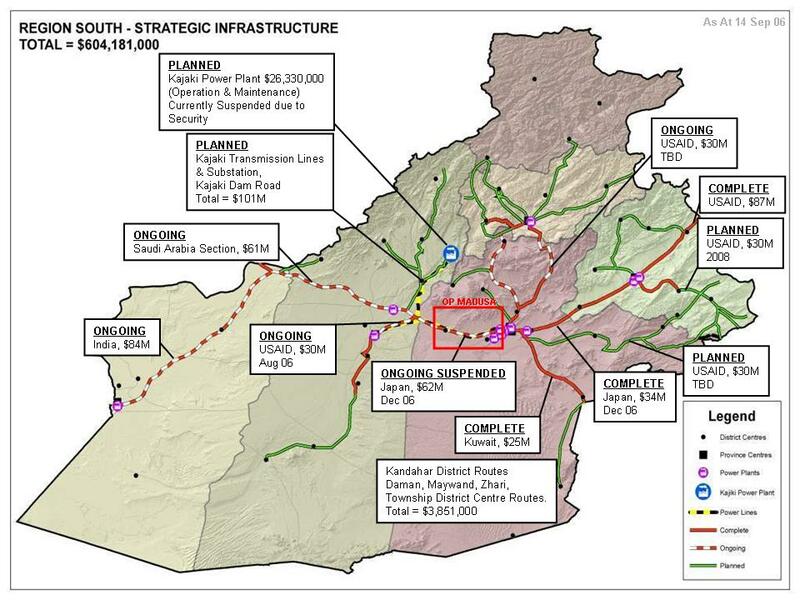 The government of Afghanistan has welcomed ISAF expansion at every stage. We're now on our third stage in the south and the tangible stability and reconstruction that PRTs bring to the provinces. 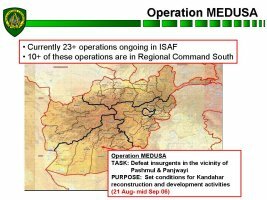 Now with regard to Operation Medusa, there is no doubt that COMISAF -- commander of ISAF, General Dave Richards, has had a most demanding tactical challenge in the southern region. 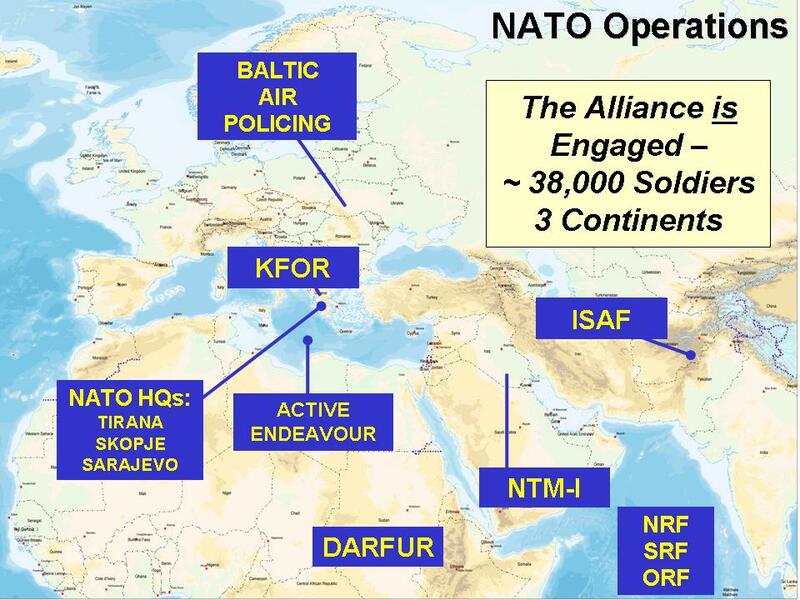 As you know, NATO assumed operational responsibility for the southern region from the coalition on the 1st of July, and we've been involved in offensive operations in that region almost continuously ever since. Operation Medusa recently terminated its active phase or its offensive phase this past weekend. 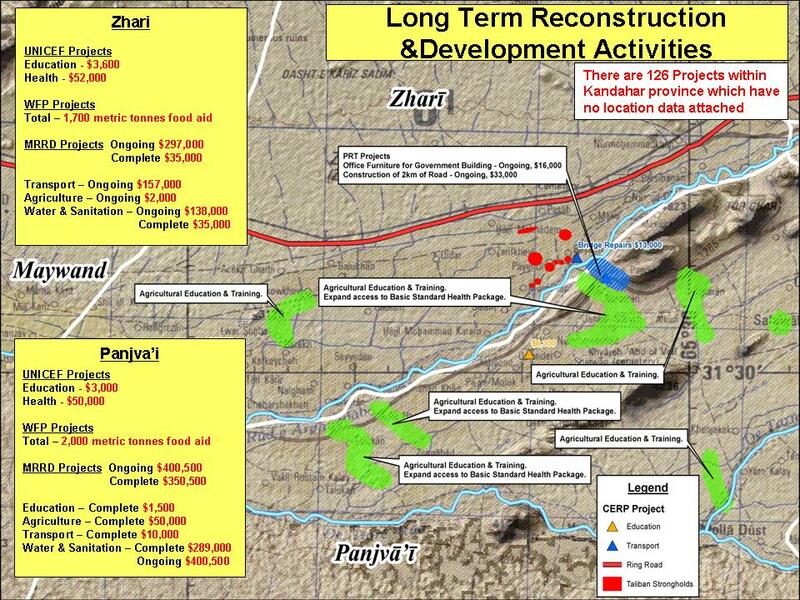 And as shown on this slide, this operation was designed to defeat insurgents in the vicinity of Pashmul and Pensjwayi in the Kandahar province in order to set the conditions for reconstruction and development. This was an offensive operation that was generated by the Taliban and forces who oppose our presence, oppose the Karzai government and decided to engage NATO in perhaps its first real operational ground test in a long, long time. 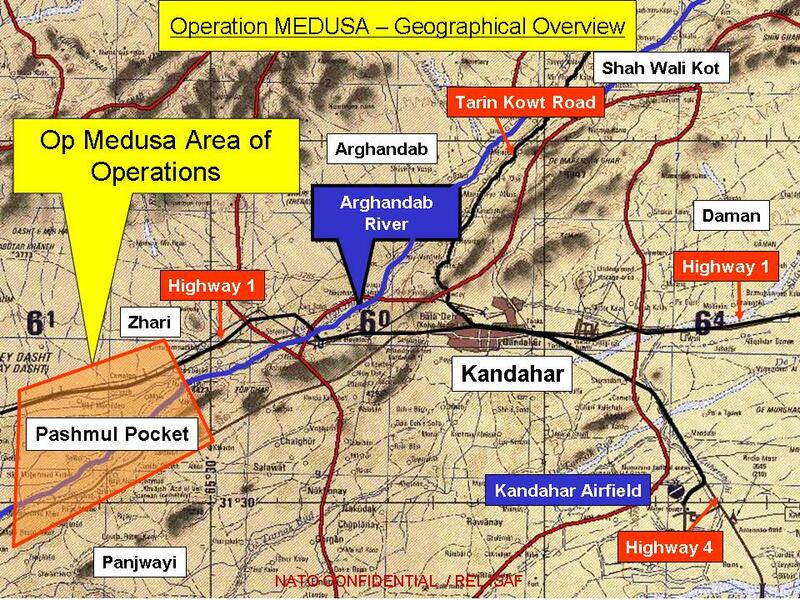 This next slide shows that the operation area itself, which we'll refer to as the Pashmul Pocket, is located roughly 50 kilometers to the west of Kandahar and is situated between Highway 1 in the north and the Arghandab River in the south. Kandahar itself, as you know, is of very important strategic as well as symbolic importance. It sits at the crossroads of many things. For instance, it's in the crossroads of the Taliban's former heartland. It's in an area that massively produces opium, narcotics trade. It has been beset by criminal and lawlessness, ineffective governmental structures and no permanent troop strength of any consequence yet, I mean, since we've been in Afghanistan. We've had -- the coalition has been able to sustain special operations missions of the kinetic type, but this is not a part of the country that has felt or even seen much of reconstruction with the -- because of the freedom of action that the opposing military forces have had in that up until this point. So the arrival of 6,000 NATO troops who had no intention of going anywhere was a culture shock to the region, and I think it's fair to say that it's primarily the Taliban decided to make a test case of this region. And I've said that we were surprised by the level of violence, and that's true. But what was really most surprising in the change in tactics because they decided to stand and fight in a fairly conventional linear sense, and they paid a very heavy price for it. And the outcome of it was that they retreated, and we are now in the consolidation phase, and we are going to start bringing aid and reconstruction to that region. So our intent throughout was the signal to the insurgents, the government of Afghanistan and the people of the region as well as to the international community, the NATO forces would not back down from exercising robust and overwhelming combat power when necessary. It was also designed to demoralize the Taliban and their supporters and deter them from believing that they could achieve a military victory on a fairly conventional -- in a fairly conventional battle and seize the initiative. 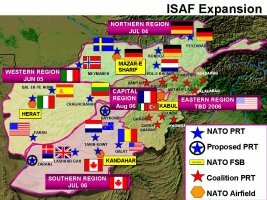 This operation was comprised of troops and assets from five nations -- Canada, Denmark, the Netherlands, the United Kingdom and the United States -- and Afghan national army battalions. The operation was further enabled by the prompt movement of Romanian, Portuguese and Estonian forces in the key operational support missions in the southern region. In my view, it demonstrated the joint and combined operations of the nations and commands involved extensive coalition air support was made available over and above the Dutch F-16s already available to COMISAF; CFC A was very, very generous in providing rifle companies -- two rifle companies from the U.S. and nonstop tac air on call for the -- for ISAF, which certainly made a huge difference. The success of our efforts was recently acknowledged when Qari Mohammed Yousaf Ahmadi, generally viewed as the Taliban's chief spokesman, announced to the Afghan Islamic press on 15 September that -- and I quote -- "The Taliban forces have conducted a tactical retreat from the Pashmul and Safaid Tawan areas of the Panjwayi district in Kandahar province," unquote. This was not a decision that was theirs alone. I assure you it was encouraged highly by ISAF. 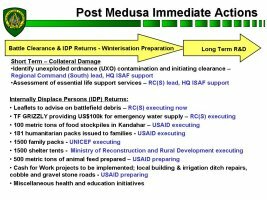 On this next slide you'll see that following the successful completion of offensive operations, that our forces immediately began the stabilization phase of Operation Medusa. In this phase we intend to provide immediate battle-damage repair and quick-impact material assistance for the returning population. The U.S., for example, has made available half a million dollars to address this urgent immediate need. As you can see on this chart, ISAF is engaged with the broader international community to enable and facilitate the return of internally displaced persons, and set the conditions for longer-term reconstruction and development activities. At the end of this conference, I'll make available to you several charts that outline the longer-term reconstruction and development activities programmed in Operation Medusa's area of operation, reconstruction and development activities in the south, and a synopsis of development activities in all of Afghanistan since 2006. It's important that we understand that the way ahead in Afghanistan is to link any successful operational mission with visible, tangible demonstration of aid and relief available to the local population. Let me switch now to my second topic, which is the force generation for ISAF, which has been well reported in the media. Following a conference in Warsaw, Poland, in which I asked for the nations' militaries to consider providing the remainder 15 percent of the forces that had been agreed upon as being necessary for this operation, we convened 48 hours later, in my headquarters at SHAPE, a force-generation conference. And it was correctly reported that there were no additional offers made. Basically, we're asking for the tactical theater reserve battalion that we felt was needed, and at the time of the fighting we felt was important to have; some more rotary- wing aircraft, some quick response forces, and the like. The total package is somewhere between 2,000-2,500 troops. And this was not a new requirement, and it was not an act of desperation. It was a sense to say that we need this force; it is already in the plan; nations have already endorsed the plan; please, let's finish the remaining 15 percent. The 48 hours that we gave them to react was probably -- the timelines were probably a little too tight. So over the next few days after the force generation conference, nations -- we kept working with nations. And now I'd like to tell you -- give you a sense of what the results of those following discussions from that force generation conference that didn't yield anything -- where we've come, a sense -- and I think this is a good news story. 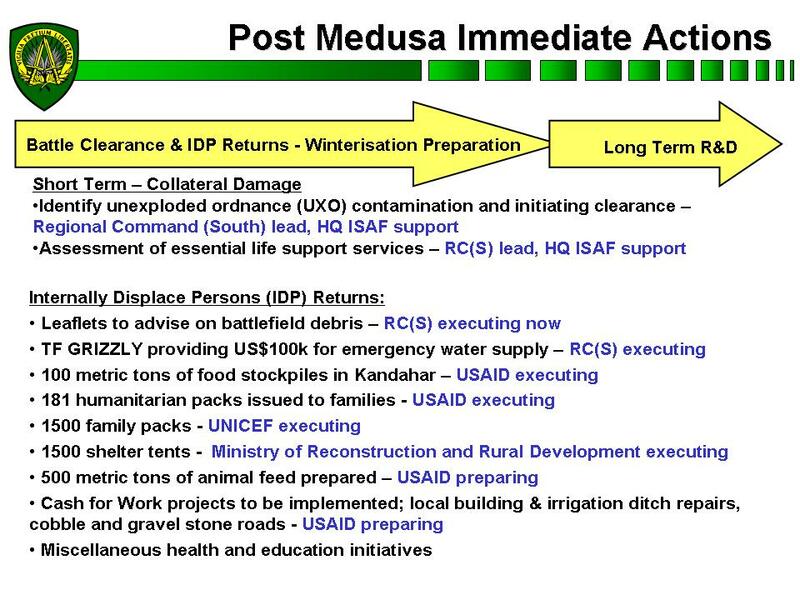 I want to stress that the outcome of Operation Medusa was never in doubt militarily. What we're looking for were the forces that would give depth and robustness to COMISAF and give him more maneuverability throughout the country. Had he had them, I probably would imagine that he would have used them, vectored them down to the south. But as the operation came to a fairly sudden close, with the opposing military forces breaking contact, the immediate moment has passed. But we still continue to say we want the rest of that force, and we want those things that COMISAF has asked for. So since then, our request of nations has yielded several positive force generation offers. First, Romania is deploying a battalion as we speak to Afghanistan, which will arrive in October and be fully operational by the middle of October. This is the Romanian force that constitutes the operational reserve for ISAF. Second, Poland has announced the deployment of a maneuver battalion, plus special operations forces, beginning in January of 2007. Poland has also agreed that if COMISAF desires to label this battalion or mission this battalion towards being the tactical theater reserve, that Poland has no caveats on the use of that battalion. And for that and for Poland's quick response, we are profoundly grateful. Canada and the United Kingdom are augmenting their forces in theater in their zone of action. And we are also incorporating more Afghan battalions in our overall operational concept. Three of the nine Kandak battalions in Region South were used in support of Operation Medusa, for example, and they acquitted themselves very well. As Afghan army units continue to come on line, they can be very useful in freeing up NATO forces for other operations and serve as a stay-behind to maintain security and enable the reconstruction to proceed without interference. And lastly, we'll continue our efforts with nations to ask them to reconsider their national restrictions, which I affectionately call caveats, in order to make the forces more useful to COMISAF. I specifically have asked the chiefs of defense to examine their quick response force -- we have quick response force company in every sector of the country -- to make them available on an emergency basis, if necessary, without the current restrictions that are placed on them. So while my remarks this morning have focused on security and operations and how we generate our forces, I want to emphasize that this is not the main story in Afghanistan. This democratically elected government and enacted independent parliament are in office. Increasingly, these elected officials are making a difference, but much more work needs to be done. Internationally, the government is engaged in a productive dialogue with neighboring countries, as evidenced by the recent talks between President Karzai and the leaders of Pakistan and India. Progress is evident in many regions in Afghanistan -- the schools and health clinics and roads, bridges, irrigation systems, electrical power generation are improving and expanding. Let me just give you a few statistics on that. More will be on the slides that we'll hand out. Today 6 million children, 2 million of which are girls, are going to school every day. Over the last four years, over 3,000 kilometers of roads have been constructed. 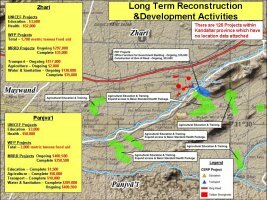 Between May and September of this year, more than $325 million have been spent on 238 development projects across the ISAF area of responsibility. 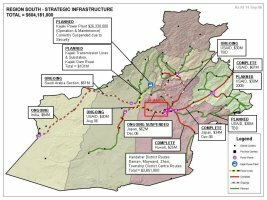 In western Afghanistan, 12 major infrastructure projects valued at $260 million are under way, and in southern Afghanistan, even in the midst of the fighting, a $62 million reconstruction of the key ring road is now ready to resume. So while military operations such as Operation Medusa may be required in the future to set the conditions for bringing good governance and reconstruction activities to the people, I'm confident that we do have a good strategy and the best soldiers in the world with which to strengthen the government of Afghanistan's effort to bring better conditions and better life and greater hope for its people. But I'd like to close by saying that it's my strong feeling that success in Afghanistan is not a military problem, and it's not a military -- it's not the province of the military to solve this problem alone. It's an important component. But if military action is not followed up by visible, tangible, sizeable and correctly focused reconstruction and development efforts, then we will be in Afghanistan for a much longer period of time than we need to be. I take as an example the contributions and the leadership of the G-8 nations in the five pillars of Afghanistan reconstruction. The police reform pillar, the judicial reform pillar, and the narcotics reform pillar are three pillars of reconstruction that absolutely need much more energy than they currently have. In particular, narcotics is at the core of everything that can go wrong in Afghanistan, if it's not properly tackled. It affects corruption, it affects crime, it affects the viable economy of Afghanistan that needs to emerge. It affects the insurgency because there's increasing evidence that a lot of the funding goes from the narcotics traffickers to the criminal elements, to what's left of al Qaeda, to the Taliban and anyone else that wants to create mischief. These three pillars have got to receive focus and energy. If we are able to do the right thing across those areas which will make the most immediate difference in Afghanistan, then we will have defined the exit strategy for the international community. 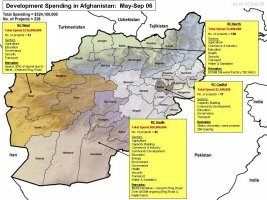 Thirty-seven countries working together to harness their energies, focus their energies, and make sure that the right amount of money goes to the right requirement, will change Afghanistan much more rapidly than anyone would think possible. Many of the people of Afghanistan are on a fence right now and they will be for whichever side wins. There's no question in my mind that the military will do its job. We need more focus in the international community to make sure that what is being spent is being sent correctly. And I think that's the task at hand, particularly in raising the level of police; in seeing visible evidence of a judicial reform system that is actually putting very, very bad people away for a very long time; and then attacking the pervasive and growing problem of narcotics, which has only gotten worse since we've started talking about it. So, I thank you very much for your attention, and I'm happy to respond to any of your questions. Q General, of the 2,000/2,500 you had sought, could you numerically state how many have been offered? And could you also talk about how many attack helicopters and transport planes that you had sought have been offered? And could you also just give us the current size of the ISAF force? GEN. JONES: Last part of the question first. The current size of ISAF is 20,083, I think. Yes, 20,083. As we think of ISAF in terms of stages one through three, recognizing that we have another expansion goal to achieve, I haven't done the math in terms of numbers, but if you look at the battalions in Poland and Romania, the increases in the Canadians' forces, numerically we are in the ballpark. There are some countries, that I am not free to announce, that are going to make some contributions in the near future. But if what I know is going to happen, and I add that up with what has happened and the declarations that have been made, numerically we will go beyond the 2,000 manpower figure. But the important thing is the quality. What are the things that go there? The infantry battalions are important, the manpower is important. We still need some help with rotary wing. We still can use some more fixed wing, although there are some indications that's coming along; offers have not been made yet, but I think we're going to have some good news there. And so basically, if you want numbers, I think we're probably going from an 85 percent figure when we started to ask for the remainder 15 percent of what we asked for, at least numerically we'll be somewhere close to 100 percent. But that's not the whole story; it's the other capabilities that we're lacking that we'd like to have. And, of course, when stage four comes on, a certain number in the U.S. force structure will come over to ISAF and that will grow the force even more. And there are a lot of enablers there, as you know. So there's -- I think there's very positive news ahead in the future. Q General, we've heard claims before that the Taliban has been defeated. Are you making that claim today? And if it's simply a tactical retreat, in the case that they'll just regroup and reattack -- (off mike) -- later. GEN. JONES: No, I'm not making that claim today. I am making the claim, and actually the spokesman's own words would indicate that they have suffered a tactical defeat in the area where they chose to stand and fight. I think that you will see -- we will see the Taliban revert to its tactics. Unfortunately, those tactics will include horrendous attacks on the civilian population, on children, and we should be outraged at that possibility when it happens, and unfortunately, it will happen. I think the Taliban will -- the Taliban and other enemy activities -- and I want to emphasize the fact that I've never signed up to the fact that every instance of violence in Afghanistan is simply the Taliban, and I think we have to be careful that we don't make this Taliban more of a threat than it really is. There are other threats. The narcotics cartels have their own industrial base. They're running an export business. They have their own security elements. They are also a force to be reckoned with, and they have good reasons to want the Taliban to stay in business and good reasons to support them financially. So that's another big problem. The criminal elements that aren't associated with either, the fact that the Taliban -- the number of Taliban hard-core fighters augmented by people they draft for a weekend to give them some money or impress them into their ranks, that's part of the equation. So I don't think they've been totally defeated. I think they will migrate to areas where they sense they can -- there's less strength, and they will resort to very symmetric tactics. Q Well, why not when you're on a role continue the offensive? GEN. JONES: Well, we are. We -- the force -- the Canadian force, when they broke contact has started rolling to the West, and the U.K. in Helmand province also is exerting pressure. So we are doing everything we can to make sure that if they do leave, that they leave and don't come back 24 hours later. So we want to send a positive signal to the people of the region that, "Okay. The fight's over for now, and here's what we're going to do to change your lives." Q General, the recent events in Afghanistan, the increased fighting in the south, the stand and fight resistance, the assassination of the governor, the increase in suicide bombings and roadside bombs have all created the perception that things are getting worse in Afghanistan. Q What is your perception of how things are going, at least in the short term here? Are things getting worse in the short term? GEN. JONES: I think that what's happened in the south -- and the south is where the focus of this violence is -- is, as I've tried to say before, is that we have disturbed the hornets' nest and the hornets are swarming. We need to make them understand that that nest is not going to be there for them anymore in that particular region. And this is why we've had this fight. We happen to have gone into the area where it's the epicenter of narcotics trade, it's the epicenter of infiltration routes, it's the epicenter home of the Taliban. It has generally been poorly governed; a lot of corruption, a lot of officials that need to be replaced. And we're going in there now to try to do all of those things and counter that. So we'll remain -- it remains to be seen how much more capacity they have for this kind of fight. I think they will look for other areas. I think they are probably doing some severe analysis about their tactics and what they chose. Where they'll reappear, I don't know. But we'll -- there's no doubt in my mind that with the coalition and ISAF forces, that we have enough troop strength to counter anything they want to throw at us. But the key, Jamie, is what is it that the international community can do to bring relief and development that's urgently needed in some of those key areas that I talked about. And that's really what needs to be done. Q But what do you say to people, whether it's member NATO countries or just members of the American public, who look at Afghanistan and say, "Gee, I thought that was going well. Now it doesn't look that way." GEN. JONES: I think it was going well in the region -- and it is going well in the regions where we had permanent presence. In the south there was no such presence; there is now. This is the test, this is a moment of -- the moment of truth. I'm hopeful that in the near future the south will become as peaceful as the north and parts of the west are. Q General, why do you think all efforts to date to reduce the opium crop have failed? The U.N. is now saying that harvest is at record levels. But despite all the attention, it seems like the crop just continues to get higher. GEN. JONES: I think it's a question of focus and will. As you know, in the -- the lead nation for narcotics reform is the United Kingdom. But that doesn't mean that the United Kingdom alone is entrusted with the entire solution set for this battle. It has to be an international set. It has to have a plan that is very broad-based and has a number of assets to it. And it has to have the commitment and the resourcing that is required to be successful. And it has to -- in addition to the demonstrated will of the elected government to start putting some big fish in jail. And we haven't seen that happen, frankly. Q So you're saying it's a question of lack of will by the Afghans themselves? GEN. JONES: Well, I think everybody wants to do the right thing. But I have not seen the organizational structures come together with the resources that would indicate to me that we are making progress. As a matter of fact, we're not making progress. We're losing ground. And that has to be reversed, because it affects the entire fabric -- social structure, economic structure, and it supports the insurgency. Q Doesn't that -- just to follow up, doesn't that lack of commitment also include the U.S.? There seemed to be an unwillingness to devote the manpower and resources early on to fighting the narcotics battle. GEN. JONES: Well, we have -- you know, we have kind of a general accepted mantra that this is not -- narcotics is not a military problem. Even the NATO mission, if you look at it, has a passive nature to supporting the narcotics problem. So that's one fact. So we know what the militaries can do and can't do. But beyond that, we have 37 sovereign nations who are involved in this country. And we, I would think, with -- properly led, properly organized, properly focused, we could tackle this problem. We have to tackle this problem. I mean, it's not "we could." We have to do this. And the longer we wait in police reform, in standing up a judicial system that works and in showing some success in narcotics, with a comprehensive, broad-based plan, the longer the military equation is going to be the one -- the only one that's going to be there. Q General, you sound kind of frustrated. Who's responsible? Who's falling down on the job here, specifically? GEN. JONES: Well, it's an enormous international structure. The overarching organization is the United Nations Assistance Mission in Afghanistan. And every country has -- each country and each organization has its own priorities and its own way of doing things. And it seems to me that there have -- there are -- I'm seeing for the first time some signs of these international groups coming together, under the leadership of President Karzai, to try to focus the level of international effort, so that it actually does some good in areas where it's most critically needed. Trying to do everything all at once and doing nothing really well is not a strategy. It is simply just a way to spend money and to hope that you're doing the right thing. So we need more focus, more organization, more planning and a sense of what is it that we really need to fix now to get this government jump-started so that it can reach out to the totality of the people. Strategic communications in Afghanistan is something that we -- with the people -- we need much more focus on. And we need experts from all walks of life who can come to the assistance of this new government to be successful. It is -- I mean, I am optimistic that we can do this. But it is not going -- it simply cannot be on the shoulders of the military forces to do all of this. Q Thank you, General. Do you at all feel hamstrung or a sense of weariness in your operations because of all the focus and military ops that are going on in Iraq? Do you think it's at all affecting your ability to conduct what you're supposed to be doing in Afghanistan? GEN. JONES: No, I don't. I think that certainly one of the most positive relationships I've had have been with General Abizaid, bringing together the -- seeing the NATO mission expand in the counterclockwise way that it has. We're on the eve of bringing all of it under one command. I think it is a very exciting time for NATO. I think NATO is going to do extremely well. I think a major test was passed in Medusa as to their -- a lot of people out there said, "Will NATO fight? Won't they fight?" Well, the Canadians primarily paid a heavy price, but they showed great courage, great bravery and tenacity that impressed everyone that saw them on the battlefield. The U.K. of course -- no question about their commitment. Dutch companies -- I mean, we're -- this is a capable force, and I don't feel -- I don't think of Afghanistan as a secondary mission. I mean, it happens to be my mission in NATO. It is NATO's most important and ambitious mission probably in the history of the alliance, so this is -- I don't feel that from the military perspective -- in terms of the mission set, I think we're going to do very well. But I think it's fair to say -- it's fair to say that the military is not the only answer. GEN. JONES: If you compare the force generation for Afghanistan to any other experience that I've had in NATO, this has been the force generation effort that we've seen. I mean, the fact that we're near a hundred percent of what we've asked for is remarkable, and so I think this is -- even though we had the silence of the -- at the donor's table two days after I spoke to the chiefs of Defense, we needed -- countries needed more time to get through their -- get their governmental approval to say, "We're going to make some offers," and they're doing that now. Q General, last time you talked to us you talked about the agreement that the Pakistani government had made because the tribal regions on the Afghan border. And I wanted to ask, is there any reason to believe that that is going to be more successful now in helping to locate Osama bin Laden and Taliban in that border area, because it sounds like it's perpetuating a policy that has not been terribly successful. GEN. JONES: My advice there would be to listen very closely, as I did, when I went to Islamabad to the Pakistani military leaders. The worries are there. I mean, the sincerity is there. I understand the ideas. I plan on meeting with my colleagues in another month or so to go back and tell them how we see it from our side of the border in terms of what the effect was. Because I think the effect will be seen very quickly. So I'm not ready to sign off with those who say, "Well, this is" -- you know, to kind of second guess what they've done. I think we will clearly see over the next 30, 60, 90 days where the situation along the border is better, worse, stays the same or whatever. So I'm -- I do -- I think we need to give to the Pakistan military the time that it needs to implement this agreement and see how it works. MR. WHITMAN: A follow-up, go ahead. Q Do you expect it to work out well? 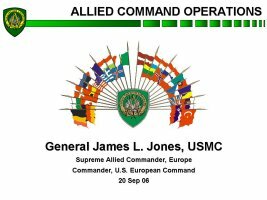 GEN. JONES: Well, one of the things I think that will happen is, in any event, the Pakistani military and NATO will be forging much, much closer links, and over time, we will be doing more together simultaneously along the borders to make sure that we reduce the infiltration as much as possible. Q General, given everything you said about the negotiations and the silence of the donor states and everything, wouldn't it be much simpler just to grab a couple of U.S. battalions, or whatever, and send them over there? Given what you said about presence has meant a lot and has a lot of impact in those regions in which you had permanent presence, wouldn't it be easier just to send U.S. troops over there, and is that a viable military and political option for you? GEN. JONES: I'm sorry, over where? GEN. JONES: You mean beyond what we've already got there? GEN. JONES: I think, you know, NATO's 20,000 troops are going to do exactly what's required, and they have shown that they have the capacity for it. We will pay a lot of attention to reconstruction. We want to emphasize that. We think that's the way ahead for pacification, if you will, or for reducing the level of violence. But it can't just be the military. So if I look at the troops that are on the ground there, be they in the coalition or be they in NATO, and somebody were to ask me, do you have enough, my answer is I have enough. And I still will ask for some niche capabilities. I still want -- we still want some more helicopters, we still want some more mobility. We may want two or three things on the margins. But in terms of the military threat that we face and the things that we're asked to do, we have enough. GEN. JONES: Nothing -- I mean, nothing -- you know, no plan survives the first bullet going down range. But based on what -- based on the contributions and based on the substance of the plan, I believe that it's adequate. And if we get the reconstruction piece jump-started in certain areas, I think you'll see dramatic improvement in a short period of time. Q The Taliban who are retreating, are they retreating cross- border into Pakistan? And also, there's been trouble in the west. Is that an indication that this insurgency is moving into a new area? GEN. JONES: Unfortunately, we weren't able to track their parade from the satellites. But my guess is -- you know, when they broke contact, they did it in a very dispersed way. There's no question that some of them went west. My guess is the hard-core guys, you know, stayed and are looking for other places. But there's no -- and others went in other directions. My feeling is that we'll probably see more activity in the western part than we've seen in the past. But we'll have to wait and see. GEN. JONES: They want to go to areas where they can live; I mean, where there is no Afghan presence -- Afghan government presence, ISAF presence, coalition presence. And they need time to recover and lick their wounds from this last engagement. But they will turn up in the areas where they detect they can operate. And that's why maneuver is important, because as soon as we detect them, we want to make sure that we deny them that and avoid a future conflict of the type that we just went through. Q You say there's a generally accepted mantra that fighting narcotics isn't the military mission. But given the fact that it's exploding, with all the consequences, the risks you mentioned, and the fact that nothing else is working, is it time to reexamine that mantra? And what could you do if you were to take it on? And is part of the problem a philosophical one that maybe fighting narcotics and fighting the insurgents in some sense is contradictory or conflicts with one another because you drive people into the arms of the Taliban? GEN. JONES: The fact is that the North Atlantic Treaty Organization has spoken and given me guidance to say what my right and left limits are with regard to narcotics is clear. We can observe, we can report, we can provide intelligence, we can make assessments, we can protect those who are involved in counternarcotics operations and we can generally provide over-watch, and that's in a supporting role. At such time as someone says, "Well, we now think that the military should be more actively involved," then we will go back to the drawing board and take a look at what it is we can do. That would be additive to the current mission that we also have. So I think that we're still at the stage in the war on narcotics of finding definition for an agreed-upon strategy that says this is how we're going to win this fight. And I'm in accord with those who say that it's not a military mission. I think that there are other forces that can do this. I think the military can be helpful in the ways that I've outlined, but I generally agree that it's not something that -- having NATO troops out there burning crops, for example, is not going to significantly contribute to the war on drugs. It's much more sophisticated and complex than that. Q General -- (off mike) -- drug eradication program in Afghanistan was conducted under the tyranny of the Taliban. Now you say that drugs are funding the Taliban. How do you explain that? GEN. JONES: Well, I think, you know, desperate people do desperate things. What was -- I'm not quite sure that the Taliban didn't profit from the drug industry. They just said, "You don't do that, but there's a certain amount of it that we're going to do, because it puts money in our coffers." So there's a little bit of a hypocritical stance there on the part of the former regime. In this particular instance, there's no hypocrisy. They absolutely need the money, and they are hand in hand working with them. GEN. JONES: Yeah, I think we always have to be very careful of that. And that's one of the reasons that -- what we did before the real kinetic part of Medusa happened was we circulated and dropped leaflets in the populated areas and urged the inhabitants to leave. And they did. And so, as a result, there were very few civilians hurt during the fighting. The estimated number of people who were displaced is about 20,000. And now we want to reach out to those 20,000 and help them come back into their homes, provide them with food, clothing and shelter, if need be, and to get them back to a better life than they had before, when the Taliban was controlling everything they did. Q But you talked about earlier that the key part is, after the kinetic action, you need to get in and show the people that you're going to do things for them. GEN. JONES: Well, when I say "we," I mean the face of the government has to be all over that effort. Now, everybody knows that the government can't do it all, and there's an international aid package that is going with it. But it has to be with the face of the -- we're supporting the government. So it's got to have the governmental face. We need the governors to be front and center. We need President Karzai to go out there and be seen out in the hinterlands. When these good things happen, this creates momentum, it creates hope, and it sends a very powerful message, particularly to the opposition that they have no chance of winning militarily. 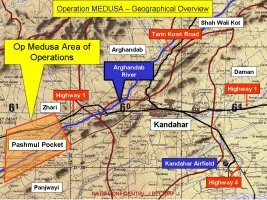 Q General, what's your overall estimate on the number of Taliban killed in Medusa? GEN. JONES: I would say that it's probably somewhere in the neighborhood of around a thousand, but you can go up two or three hundred. If you said 1,500, it wouldn't surprise me. But I think that's a fair number. 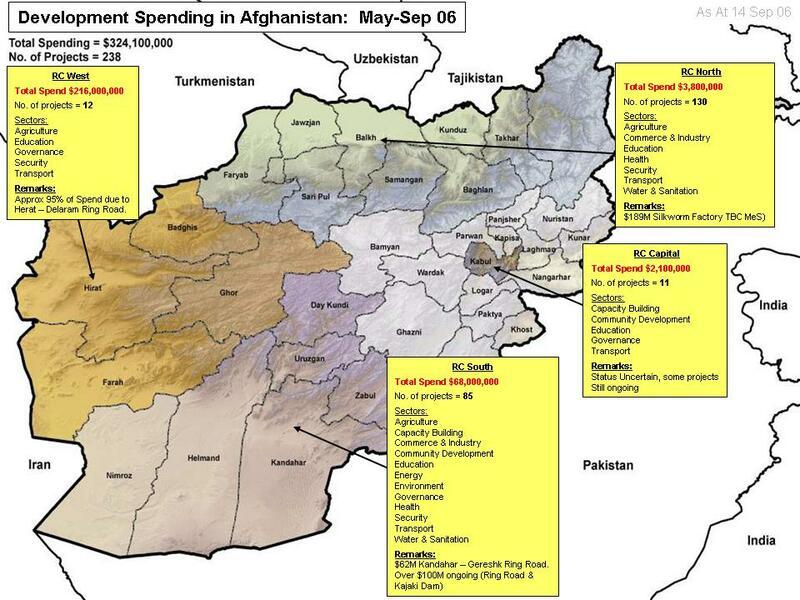 Q So what's an estimate on the overall Taliban force? GEN. JONES: Total. No, the total force. I think total force is a -- isn't that where we think, Steve, about? 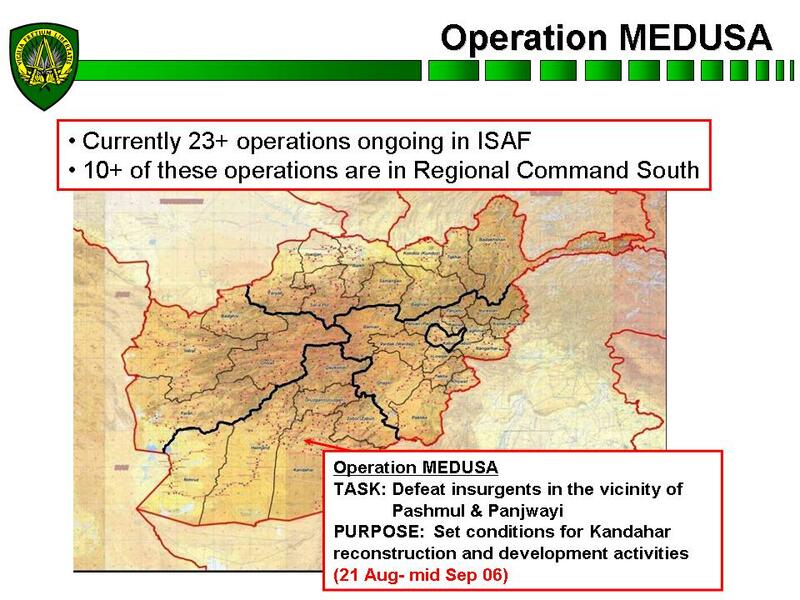 Q So this operation, it's already taken out a third to a half of the Taliban hard-core force, do you believe? GEN. JONES: (Off mike) -- I think -- yeah, I think if they started -- I think in terms of what was there, but what we don't know, what we don't have clear figures on is their ability to regenerate themselves. The -- and that is a serious problem. I mean, let's face it, it's -- what I'm -- the number I'm giving you is basically saying, "I think that any one time there's about 3,000 to 4,000 Taliban," but they're not the only problem. There's also the al Qaeda remnants, which is considerably less. Then, there's the cartels with their own armies for security of their convoys, and this is a problem. Then, you have the corruption, the criminal elements, the tribal fighting that goes on. So there's -- it's a lot of disparate groups, but that's kind of the way we see it. Q General, you said that you were somewhat surprised that the Taliban stood in the fight, and clearly, the Europeans were -- maybe even more surprised. For someone who tracks the European debate, how do you -- how is it played over there as far as their will to continue this? And also too, when this rotation comes up some time next year, when they need more NATO troops to replace the ones that have been there for a year, are you confident those troops will be there? GEN. JONES: Yes. I think the governments have been very strong, particularly Canada, as has been -- Canadian leadership has been very, very strong in this. Canadian forces did an absolutely superb job, augmented by the British colleagues, a Dutch company that came in, two companies from the U.S. Everyone that participated in the south, all eight countries, both actively supporting the fight and also providing the enablers, just did a great job. This mission for NATO is still in the ascendency phase. We still have another stage to go, we still have Stage 4. So we are gaining momentum, we're not losing momentum. And I think that the best way to keep the 37 countries involved in this is to be able to show that the reconstruction effort is really doing what it's supposed to do. MR. WHITMAN: We're going to need to make that the last one, General, because we're out of time. Q Thank you, sir. I have a question for you internationally as the EUCOM chief. As you know, Moscow decided to postpone the regular U.S.-Russian military exercises, Torgau 2006, earlier this month. Do you think this was an unfortunate decision that might somehow affect negatively U.S.-Russian mil-to-mil contacts? And do have -- did you resolve the differences over this? Have you set a new date for the exercises? GEN. JONES: We have not set a new date for the exercise, that I know of. And mil-to-mil relationships during my four years in this job have been uniformly excellent. I interpret this as a -- hopefully, just a temporary speed bump in the relationship, and we'll get back onto the steady state volume that we've had both at NATO and with the U.S. European Command. It's very important that we stay together on this. These interoperability programs, a common focus on terrorist issues, and regular exchange of ideas with the Russian security forces is absolutely one of the most important things we do.